A first, essentially Indian, aniconic phase (avoiding direct representations of the Buddha), was followed from around the 1st century CE by an iconic phase (with direct representations of the Buddha). From that time, Buddhist art diversified and evolved as it adapted to the new countries where the faith was expanding. It developed to the north through Central Asia and into Eastern Asia to form the Northern branch of Buddhist art, and to the east as far as Southeast Asia to form the Southern branch of Buddhist art. In India, Buddhist art flourished and even influenced the development of Hindu art, until Buddhism almost disappeared around the 10th century with the expansion of Hinduism and Islam. The first clear manifestations of Buddhist art date back to the time of the emperor Ashoka during the Mauryan era (322-180 BCE), through the building of numerous stupas, such as the one at Sanchi, and the erection of pillars. The pillars were surmounted by animal capitals and decorated with Buddhist symbols (such as the wheel), which invoked respect for all creatures and the acceptance of the Dharma. During the 2nd to 1st century BCE, sculptures became more explicit, representing episodes of the Buddha’s life and teachings. These took the form of votive tablets or friezes, usually in relation to the decoration of stupas. The Wheel of law (skt. dharmacakra), symbol of the Four Noble Truths expressed by the Buddha. This reluctance towards anthropomorphic representations of the Buddha, and the sophisticated development of aniconic symbols to avoid it (even in narrative scene where other human figures would appear), seems to be connected to one of the Buddha’s sayings, reported in the Dighanikaya, that disfavored representations of himself after the extinction of his body. This tendency remained as late as the 2nd century CE in the Southern parts of India, in the art of the Amaravati school (see: Mara’s assault on the Buddha).It has been argued that earlier anthropomorphic representations of the Buddha may have been made of wood and may have perished since then. However, no related archaeological evidence has been found. The art of Gandhara benefited from centuries of interaction with Greek culture since the conquests of Alexander the Great in 332 BCE and the subsequent establishment of the Greco-Bactrian and Indo-Greek Kingdoms, leading to the development of Greco-Buddhist art. Gandharan Buddhist sculpture displays Greek artistic influence, and it has been suggested that the concept of the “man-god” was essentially inspired by Greek mythological culture. Artistically, the Gandharan school of sculpture is said to have contributed wavy hair, drapery covering both shoulders, shoes and sandals, acanthus leaf decorations, etc. A Northern route was established from the 1st century CE through Central Asia, Tibet, China, Korea, and Japan, in which Mahayana Buddhism prevailed. The Silk Road transmission of Buddhism to Central Asia, China and ultimately Korea and Japan started in the 1st century CE with a semi-legendary account of an embassy sent to the West by the Chinese Emperor Ming (58-75 CE). However, extensive contacts started in the 2nd century CE, probably as a consequence of the expansion of the Kushan Empire into the Chinese territory of the Tarim Basin, with the missionary efforts of a great number of Central Asian Buddhist monks to Chinese lands. The first missionaries and translators of Buddhists scriptures into Chinese, such as Lokaksema, were either Parthian, Kushan, Sogdian or Kuchean. Central Asian missionary efforts along the Silk Road were accompanied by a flux of artistic influences, visible in the development of Serindian art from the 2nd through the 11th century CE in the Tarim Basin, modern Xinjiang. Serindian art often derives from the Greco-Buddhist art of the Gandhara district of what is now Pakistan, combining Indian, Greek and Roman influences. Silk Road Greco-Buddhist artistic influences can be found as far as Japan to this day, in architectural motifs, Buddhist imagery, and a select few representations of Japanese gods. Buddhist art in Afghanistan (old Bactria) persisted for several centuries until the spread of Islam in the 7th century. It is exemplified by the Buddhas of Bamiyan. Other sculptures, in stucco, schist or clay, display very strong blending of Indian post-Gupta mannerism and Classical influence, Hellenistic or possibly even Greco-Roman. Although Islamic rule was rather tolerant of other religions “of the Book”, it showed little tolerance for Buddhism, which was perceived as a religion depending on idolatry. Human figurative art forms also being prohibited under Islam, Buddhist art suffered numerous attacks, which culminated with the systematic destructions by the Taliban regime. The Buddhas of Bamiyan, the sculptures of Hadda, and many of the remaining artifacts at the Afghanistan museum have been destroyed. Thereafter, the expansion of Buddhism to the North led to the formation of Buddhist communities and even Buddhist kingdoms in the oasis of Central Asia. Some Silk Road cities almost only consisted in Buddhist stupas and monasteries, and it seems that one of their main objectives was to welcome and service travelers between East and West. The eastern part of central Asia (Chinese Turkestan (Tarim Basin, Xinjiang) in particular have revealed an extremely rich Serindian art (wall paintings and reliefs in numerous caves, portable paintings on canvas, sculpture, ritual objects), displaying multiple influences from Indian and Hellenistic cultures. Works of art reminiscent of the Gandharan style, as well as scriptures in the Gandhari script Kharoshti have been found. These influences were rapidly absorbed however by the vigorous Chinese culture, and a strongly Chinese particularism develops from that point. Buddhism arrived in China around the 1st century CE (although there are some traditions about a monk visiting China during Asoka’s reign), and through to the 8th century it became very active and creative in the development of Buddhist art, particularly in the area of statuary. Receiving this distant religion, China soon incorporated strong Chinese traits in its artistic expression. The year 67 CE saw Buddhism’s official introduction to China with the coming of the two monks Moton and Chufarlan. In 68 CE, under imperial patronage, they established the White Horse Temple (白馬寺), which still exist today, close to the imperial capital at Luoyang. By the end of the second century, a prosperous community had been settled at Pengcheng (modern Xuzhou, Jiangsu). In the 5th to 6th centuries the Northern Dynasties, rather removed from the original sources of inspiration, tended to develop rather symbolic and abstract modes of representation, with schematic lines. Their style is also said to be solemn and majestic. The lack of corporeality of this art, and its distance from the original Buddhist objective of expressing the pure ideal of enlightenment in an accessible, realistic manner, progressively led to a research towards more naturalism and realism, leading to the expression of Tang Buddhist art. Following a transition under the Sui Dynasty, Buddhist sculpture of the Tang evolved towards a markedly life-like expression. Because of the Dynasty’s openness to foreign influences, and renewed exchanges with Indian culture due to the numerous travels of Chinese Buddhist monks to India from the 4th to the 11th century, Tang dynasty Buddhist sculpture assumed a rather classical form, inspired by the Indian art of the Gupta period. During that time, the Tang capital of Chang’an (Today’s Xi’an) became an important center for Buddhism. From there Buddhism spread to Korea, and Japanese embassies of Kentoshi helped gain footholds in Japan. However, foreign influences came to be negatively perceived towards the end of the Tang dynasty. In the year 845, the Tang emperor Wuzong outlawed all “foreign” religions (including Christian Nestorianism, Zoroastrianism and Buddhism) in order to support the indigenous Taoism. He confiscated Buddhist possessions, and forced the faith to go underground, therefore affecting the ulterior development of the religion and its arts in China. Chan Buddhism however, at the origin of Japanese Zen, continued to prosper for some centuries, especially under the Song dynasty (1127-1279), when Chan monasteries were great centers of culture and learning. The popularization of Buddhism in China has made the country home to one of the richest collections of Buddhist arts and heritages in the world. It is evident in the many scripture-filled caves and structures surviving today. The Mogao Caves near Dunhuang and the Bingling Temple caves near Yongjing in Gansu province, the Longmen Grottoes near Luoyang in Henan province, the Yungang Grottoes near Datong in Shanxi province, and the Dazu Stone Carvings near Chongqing municipality are among the most important and renowned Buddhist sculptural sites. The Leshan Giant Buddha, carved out of a hillside in the 8th century during Tang Dynasty and looking down on the confluence of three rivers, is still the largest Buddha statue in the world. Korean Buddhist art reflects an interaction between Chinese Buddhist influence and a strongly original Korean culture, where influences from China and the art of the steppes (possibly Scythian influences according to some old artifact such as Silla royal crowns in the style of the steppes) intermixed. The style of this indigenous art was geometric, abstract and richly adorned with a characteristic “barbarian” luxury. Buddhism was introduced in the 6th century, quite later than its introduction in China. Although Chinese influence was strong, Korean Buddhist art «bespeaks a sobriety, taste for the right tone, a sense of abstraction but also of colours that curiously enough are in line with contemporary taste» (Pierre Cambon, Arts asiatiques- Guimet). Before the introduction of Buddhism, Japan had already been the seat of various cultural (and artistic) influences, from the abstract linear decorative art of the indigenous Neolithic Jomon from around 10500 BCE to 300 BCE, to the art during the Yayoi and Kofun periods, with developments such as Haniwa art. Japan, the largest Buddhist country today, discovered Buddhism in the 6th century when monks traveled to the islands together with numerous scriptures and works of art. The Buddhist religion was adopted by the state in the following century. 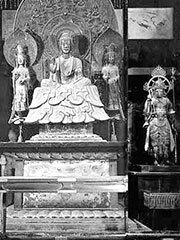 Being geographically at the end of the Silk Road, Japan was able to preserve many aspects of Buddhism at the very time it was disappearing in India, and being suppressed in Central Asia and China. From 710, numerous temples and monasteries were built in the capital city of Nara, including a five-story pagoda, the Golden Hall of the Horyuji, and the Kofuku-ji temple. Countless paints and sculpture were made, often under governmental sponsorship. Indian, Hellenistic, Chinese and Korean artistic influence blended into an original style characterized by realism and gracefulness. The creation of Japanese Buddhist art was especially rich between the 8th and 13th century during the periods of Nara, Heian and Kamakura.Japan developed an extremely rich figurative art for the pantheon of Buddhist deities, sometimes combined with Hindu and Shinto influences. This art can be very varied, creative and bold. From the 12th and 13th, a further development was Zen art, following the introduction of the faith by Dogen and Eisai upon their return from China. Zen art is mainly characterized by original paintings (such as sumi-e and poetry (especially haikus), striving to express the true essence of the world through impressionistic and unadorned “non-dualistic” representations. The search for enlightenment “in the moment” also led to the development of other important derivative arts such as the Chanoyu tea ceremony or the Ikebana art of flower arrangement. This evolution went as far as considering almost any human activity as an art with a strong spiritual and aesthetic content, first and foremost in those activities related to combat techniques (martial arts). One of the most characteristic creations of Tibetan Buddhist art are the mandalas, diagrams of a “divine temple” made of a circle enclosing a square, the purpose of which is to help Buddhist worshipers focus their attention through meditation and follow the path to the central image of the Buddha.Artistically, Buddhist Gupta art and Hindu art tend to be the two strongest inspirations of Tibetan art. In the south, the kingdom of Champa has a strongly Indianized art, just as neighboring Cambodia. Many of its statues were characterized by rich body adornments. The capital of the kingdom of Champa was annexed by Vietnam in 1471, and it totally collapsed in the 1720s. During the 1st century CE, the trade on the overland Silk Road tended to be restricted by the rise of the Parthian empire in the Middle East, an unvanquished enemy of Rome, just as Romans were becoming extremely wealthy and their demand for Asian luxury was rising. This demand revived the sea connections between the Mediterranean Sea and China, with India as the intermediary of choice. From that time, through trade connection, commercial settlements, and even political interventions, India started to strongly influence Southeast Asian countries. Trade routes linked India with southern Burma, central and southern Siam, lower Cambodia and southern Vietnam, and numerous urbanized coastal settlements were established there. Between the 1st and 8th centuries, several kingdoms competed for influence in the region (particularly the Cambodian Funan then the Burmese Mon kingdoms) contributing various artistic characteristics, mainly derived from the Indian Gupta style. Combined with a pervading Hindu influence, Buddhist images, votive tablets and Sanskrit inscriptions are found throughout the area. From the 9th to the 13th centuries, Southeast Asia had very powerful empires and became extremely active in Buddhist architectural and artistic creation. The Sri Vijaya Empire to the south and the Khmer Empire to the north competed for influence, but both were adepts of Mahayana Buddhist, and their art expressed the rich Mahayana pantheon of the Bodhisattvas.Theravada Buddhism of the Pali canon was introduced to the region around the 13th century from Sri Lanka, and was adopted by the newly founded ethnic Thai kingdom of Sukhothai. Since in Theravada Buddhism only monks can reach Nirvana, the construction of temple complexes plays a particular important role in the artistic expression of Southeast Asia from that time. A neighbor of India, Myanmar was naturally strongly influenced by the eastern part of Indian territory. The Mon of southern Burma are is said to have been converted to Buddhism around 200 BCE under the proselytizing of the Indian king Ashoka, before the scission between Mahayana and Hinayana Buddhism. Early Buddhist temples are found, such as Beikthano in central Myanmar, with dates between the 1st and the 5th century. The Buddhist art of the Mons was especially influenced by the Indian art of the Gupta and post-Gupta periods, and their mannerist style spread widely in Southeast Asia following the expansion of the Mon Empire between the 5th and 8th centuries. Later, thousands of Buddhist temples were built at Pagan, the capital, between the 11th and 13th centuries, and around 2,000 of them are still standing. Beautiful jeweled statues of the Buddha are remaining from that period. Creation managed to continue despite the seizure of the city by the Mongols in 1287. Cambodia was the center of the Funan kingdom, which expanded into Burma and as far south as Malaysia between the 3rd and 6th centuries CE. Its influence seems to have been essentially political, most of the cultural influence coming directly from India. Angkor was at the center of this development, with a Buddhist temple complex and urban organization able to support around 1 million urban dwellers. A great deal of Cambodian Buddhist sculpture is preserved at Angkor, however organized looting has had a heavy impact on many sites around the country. From the 1st to 7th centuries, Buddhist art in Thailand was first influenced by direct contact with Indian traders and the expansion of the Mon kingdom, leading to the creation of Hindu and Buddhist art inspired from the Gupta tradition, with numerous monumental statues of great virtuosity. Like the rest of Southeast Asia, Indonesia seems to have been most strongly influenced by India from the 1st century CE. The islands of Sumatra and Java in western Indonesia were the seat of the empire of Sri Vijaya (8th-13th century CE), which came to dominate most of the area around the Southeast Asian peninsula through maritime power. The Sri Vijayan Empire had adopted Mahayana and Vajrayana Buddhism, under a line of rulers named the Sailendras. Sri Vijaya spread Mahayana Buddhist art during it expansion in the Southeast Asian peninsula. Numerous statues of Mahayana Bodhisattvas from this period are characterized by a very strong refinement and technical sophistication, and are found throughout the region. Extremely rich architectural remains are visible at the temple of Borobudur (the largest Buddhist structure in the world, built from around 780), which counts 505 images of the seated Buddha. The Indonesian Buddhist Empire of Sri Vijaya declined due to conflicts with the Chola rulers of India, before being destabilized by the Islamic expansion from the 13th century.